With a new right-wing government and a growing number of Indians admiring Israel’s aggressive foreign policy, India’s response to Gaza has been fairly muted. Will Prime Minister Modi reverse the country’s longstanding support of Palestine? A contribution to the openGlobalRights debate on Emerging Powers and Human Rights. With the third largest Muslim population in the world, the Indian public was starkly divided over Israel’s recent military action in Gaza. The existing fissures in society have become even more accentuated with a new right-wing government in power. In recent months, anti-Israel protests have exploded throughout the country, and Muslims weren’t the only ones taking to the streets. 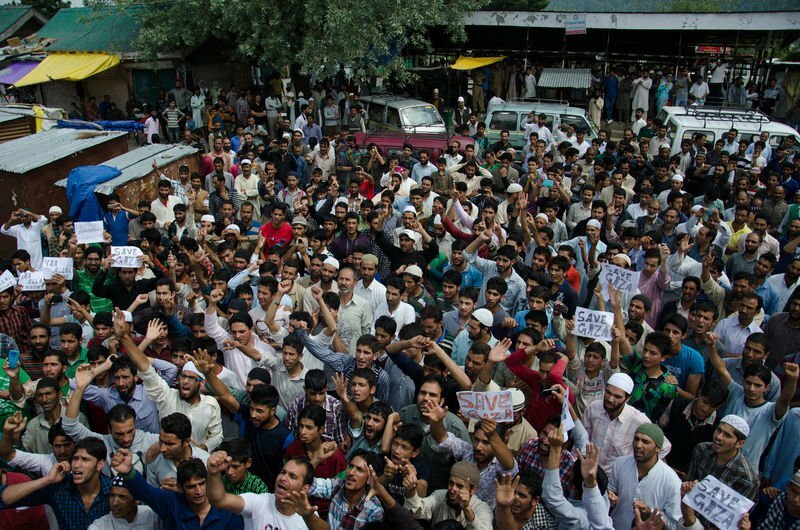 Anti-Israel protests on August 18th, 2014 in Kashmir, India. Like Brazil, India’s voice is of little significance in West Asia and the Israel-Palestine peace process. Yet, Israel regularly updates New Delhi on key issues pertaining to Palestine. And until a few years ago, in the hopes that India would become a bigger player in the issue, the Palestinian authority was doing the same. Nonetheless, the political parties in India consistently respond to developments in the region, with an eye to the large Muslim electorate. But India’s response to the Gaza crisis was tepid at best. Many middle class Indians, mostly supporters of Prime Minister Narendra Modi’s Bharatiya Janata Party (BJP), admired Israel’s aggressive response to Hamas. They believe a strong military response—sending in troops to pursue and destroy Hamas—is the only way to deal with the security threat. The fact that civilians were killed or injured by Israeli air force assaults was largely shrugged off as unavoidable collateral damage. In fact, Israel has become a role model for both the BJP and the extended far-right groups that make up its ideological backbone. As in other parts of the world, there is widespread sympathy for the Jews because of their past history, even among Modi’s detractors and especially within the Hindu middle class. Their admiration for Israel is also linked to military power and Israel’s ability to survive in a hostile Arab neighbourhood. There is no escaping that right-wing Indian support is largely rooted in the fact that Israel’s enemies are Muslim. The country’s right-wing holds a strong grudge against Indian Muslims, largely due to successive Muslim invasions since the 12th century that destroyed Hindu temples. Indian admirers now want Modi to replicate Tel Aviv’s tough stand on terror with Pakistan. Shantanu Barooah, a BJP supporter who is also pro-Israeli, says, “I wish the Indian government would be as tough with Pakistan as Israel has been with Hamas…. If the Indian army were allowed to go in and destroy the terror camps in Pakistan, we would not have had to deal with so many terror attacks.” In fact, the BJP has been extremely critical of the former Congress-led UPA alliance for its soft stand on terrorist acts. Many within the Sangh Parivar and their intellectual supporters fully endorse the idea of Indian troops crossing into Pakistan to destroy what Delhi dubs “the infrastructure of terror”. It is one thing, however, to criticize the government when you are in the opposition. It is quite another to actually deal with terrorism as part of the government. After a terror attack on the Indian Parliament during the NDA rule, India rushed its troops to the Pakistan border, leading to a very tense face-off. The fact that both South Asian nations possess nuclear weapons certainly doesn’t help: any tension here can be exceedingly dangerous. But Modi supporters want a muscular, “Israeli-esque” foreign policy, apparently regardless of the consequences. On the flip side, equally large numbers in India are horrified by Israel’s excessive use of force. Indian liberals naturally support the Palestinian cause and are appalled that 504 children have been killed, though they do not necessarily approve of Hamas. Yasser Arafat was a hero in India; his PLO earned widespread respect. And although people do distinguish between Fatah and Hamas, many are starting to believe that Hamas has no choice but to do what it has been doing, simply because no one cares for the people of Gaza. Palestinians are the underdogs in the region, and therefore they garner much sympathy among Indian liberals. These are pertinent questions. Indian Muslims have also distanced themselves from the problems fellow Muslims face in the Kashmir valley. In fact in 2010, when over 100 young Kashmiris were killed during protests in the valley, only NGOs spoke up against this atrocity. This reluctance is partly due to the fact that Indian Muslims have to constantly prove their loyalty to their country. Speaking up for fellow Muslims in the Kashmir valley would incite a harsh reaction from majority Hindus, especially given Pakistan’s history behind the Kashmiri cause. Even liberal MP’s did not speak out, because there was an underlying feeling that Pakistan was instigating the Kashmiri youth. So, while it is fine to talk about Muslim solidarity in far away places like Gaza, Indian Muslims in the rest of the country studiously avoid commenting on Kashmir. The government of India now must find a balance between these two extreme views. New Delhi has excellent bilateral relations with Israel, and has historically supported the Palestinian fight for a homeland. India was the first non-Arab state to recognize the PLO as the sole representative of the Palestinian people in 1974, and the PLO had a small office set up in Delhi. In 1988, India recognized Palestine as a state. In October 2003, when the BJP-led National Democratic Alliance was in power, India voted against Israel’s construction of the security wall. Yet, since 1992 relations between the two countries have improved dramatically. India-Israel trade now amounts to around $6 billion, from a base as low as $200 million in 1992. Israel is now India's second largest supplier of defence equipment, with India about to purchase Barak-1 anti-ship missiles from a formerly blacklisted Israeli company. Overall, the Indian response to the Gaza conflict was fairly restrained, following the lead of the Gulf countries. Whether this is due to divisions within the Indian public or the personal inclinations of India’s leaders is still unclear. Even with Modi’s personal preference to back Israel, it seems doubtful that he will reverse India’s traditional policy and simply ignore Palestine. But with domestic calls to pay more attention to human rights inside India, and a strong right-wing that wants to mimic Israeli policy against Pakistan-based terrorists, we will have to wait and see. Modi may just surprise us yet.